Balancing On My Toes: Oh The Places You'll Go....Our Moving Story! Oh The Places You'll Go....Our Moving Story! So we have been officially in our apartment for over a week now and can almost officially say that we are completely moved in. We have a mattress to pick up from Tim's dads house, a bed frame and box spring from my parents house, and then our new Pier 1 headboard to pick up- but that's all! There are plenty more things to buy (I don't think that list will ever shrink) but I think we are doing well over here! We took a few car loads of stuff so we could start unloading everything into the apartment. We rented a truck over the weekend but there were a few things I didn't want to just throw in the back of a truck. We also had a ton of furniture to build from Ikea and wanted to try to get that built before we moved everything in. I highly recommend building all furniture first so you don't have to wait to unload boxes. It made it easy for us to put away clothing and other items. We spent multiple nights building furniture. Tim and I started out each building our own nightstands from Ikea. They were fairly easy to build although there were certainly enough pieces! Over the course of this week we collectively have built two nightstands, two dressers, a coffee table, and a bookshelf. Yes, we are ambitious. Our living room with just a few items inside. We used our living room as a processing area throughout the moving process. Once we got a box upstairs we would put it down in the living room. Later on when we were sorting it was nice to be able to open all boxes in the living room and figure out where everything was going to go. I highly recommend having a processing area! I originally wanted boxes to be dispersed among rooms but I found it easier to deal with everything in our massive living room. Just our apartment number, lucky #13! Friday night we had our first meal in the apartment- we headed to the local supermarket Dave's and grabbed some food from the hot bar. It was very good and I ate every bit of my mac and cheese and mashed potatoes. Tim's sister Brit came to help us put together furniture as well. We are lucky to be living only a few roads away from her, her boyfriend and their new puppy! It was so weird to look around my bedroom that I've lived in for the last year and a half and find it empty. It's even stranger to know that I'm moving into a place that we are making our first home together! At some point we plan to buy a house but this will be our home for the next couple of years! When Tim pulled up with the truck I was ready to get started! I didn't take any pictures that I wanted to on moving day. I wanted to get a picture of us next to the truck, I wanted to take pictures as we moved things in...but I was extremely focused. Tim and I moved as efficiently as we could with the help of my mom who was awesome! She lifted and carried more then she should have been doing and we appreciated her help so much. It has been so fun to decorate an entire apartment! We have had a great time picking everything out together. The theme of my bedroom was already a beachy theme so we did stick with that. I am also pretty minimalistic when it comes to decor, I don't like having tons of things to dust! We have picked out very simple, plain items which has worked out great so far. Remember this is just a sneak peek into our apartment! Things are still evolving and I will be sharing everything once it's completed. 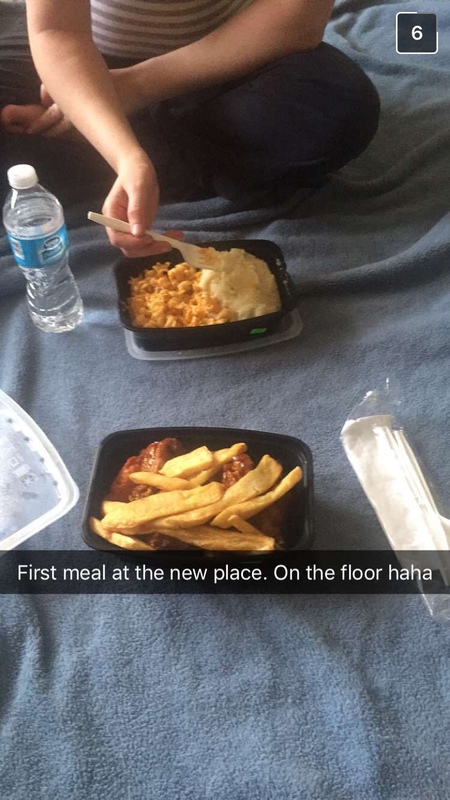 When our coffee table arrived we were excited to have a table to eat off of! We also have been putting up curtains which has made it feel more like home! When our couch arrived on Saturday everything instantly felt completed! Even though there is still a ton of items we still need to hang, even though some areas have just been filled with stuff and not sorted properly, putting a couch in the living room has made it feel homey! Thanks for checking out our moving story! I'll be back to share more details!